A display of a portfolio that focuses attention on a few key design attributes that are important for portfolio management. The Manifest approach to long-term investing depends on speedy assessments of our portfolios known as dashboards. A quick glance at any dashboard can tell us whether we're on course with our expectations using projected annual return, overall quality or sales growth. It's quick and easy to get started, adding a name for your portfolio and entering the tickers and shares held, then monitor the key elements: portfolio projected return, quality and forecasted sales growth. Portfolio-centered decision-making becomes a reality. We simply observe what our portfolios need. Are the projected returns sufficient and consistent with your time horizon and risk tolerance? How’s the overall quality? The underlying fundamentals are continuously updated, making sure your dashboards deliver a powerful resource for staying on track. 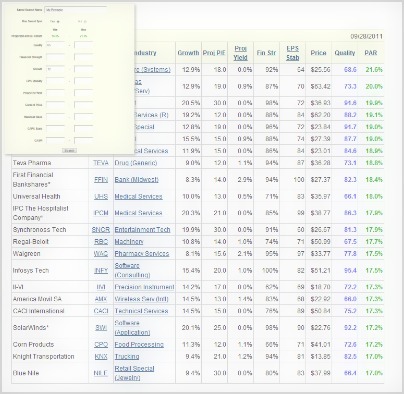 An easy to use yet powerful screening resource to discover stocks for further study. Manifest makes is easy to quickly find stocks that match your long-term goals, or requirements for your portfolio using Manifest's StockSearch. Search on key attributes like quality, projected return, and growth, narrowing the field on candidates to an easy to review list. Or, use Manifest's rank to narrow the field to best alternatives using one easy criteria. Limit your search to specific sectors or industries and sort the result by any attribute. Save any StockSearch by adding a name for the search criteria and revisit the results at a later date. Manifest's StockSearch makes portfolio-centered decision-making snap, allowing you to find companies that fit for your dashboard's requirements. 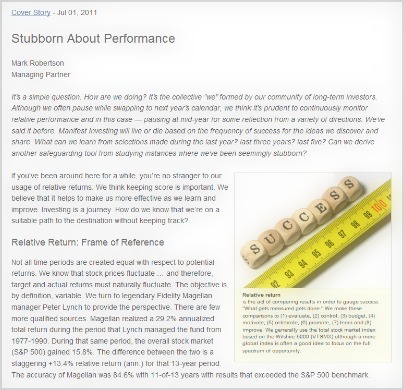 Commentary you need to become a better, more intelligent investor -- a new issue of Expected Returns every month. Each month we feature a topic of long-term investing interest and follow with detailed discussion of the investing potential for a specific company. 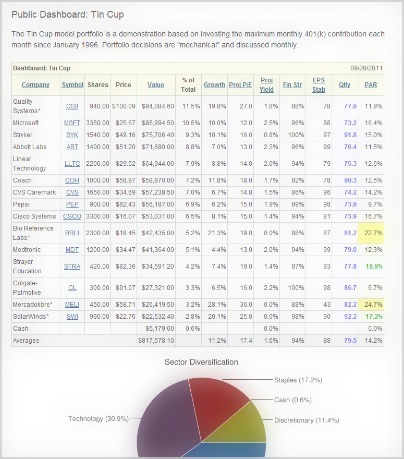 We put our methodology to the test with demonstration model portfolios, Hoard vs. Herd, our fund feature, and Tin Cup, a monthly status report and detail of decisions made for a long-term model portfolio. Ideas for personal study or for your club meeting, the Sweet 16 provides monthly screening results intended to deliver ideas for potential stock studies. Every issue of the newsletter is archived, so you can read every article Manifest has ever published. Learn the ins and outs of portfolio-centered decision-making and make future investments with confidence. A community you can depend on to help you become a better and more successful investor. Manifest is all about long-term investing, and we offer a number of resources to further your education. The Forum provides a place to share ideas, explore methods and have some fun. Have a question? 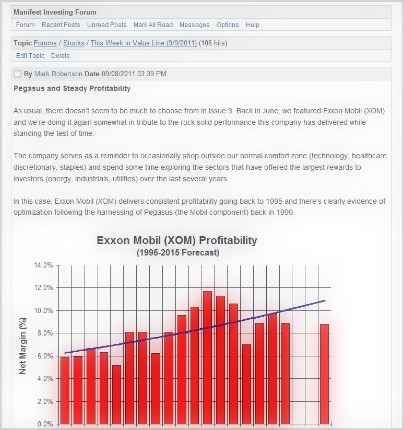 Lean on scores of like-minded investors on our Forum and see what they think. It's the perfect place for asking questions and sharing information. You'll discover that the members share a common purpose: To be supportive as we all strive to achieve better long-term results. Our forum is a Continuous Classroom, with discussions on stock studies and topics selected or suggested by Manifest members. Manifest also provides a series of monthly webinars. We’ll identify companies positioned for strong performance, explore portfolio design and management concepts and help you make the most out of Manifest Investing. Join thousands of people who have discovered a more productive way to invest.